3. By placing dental implants - in most cases this is the best and optimal treatment for a missing tooth. The advantages are that there is no need to thinn the adjacent natural teeth, but also protects against bone loss (which is observed in the previous two points). Dental implants are made of "Ti" (titanium) - this is a bio-inert material (metal) with good mechanical properties. There is a modul of elasticity which is closer to bone than other materials. Already under construction are implants made by "Zr" (Zirconium). This material has a color as a natural tooth. Zirconia implants are appropriate to use in cases where aesthetics is necessary. A dental implant is the only option to replace the missing tooth as in respect of the crown, and in terms of the root. Imlpantat acts as a natural tooth root that transfers masticatory forces and keeps bones healthy. Once you have discussed all possible treatment options with your implantologist and you choose exactly this method of recovery, planning and placement of implants are up to. Before the surgery patients need to have computer tomography (CT) and an panoramic X-ray. CT is used to determine the distance of the implant to adjacent anatomical structures such as sinus maxillaris, canalis mandibularis, canalis mentalis and others. 3D study allows precise treatment planning for complex clinical cases. Bone density is calculated in slices of 1 mm. Determining bone density in various parts of the x-ray provides definition to the best location of dental implants (direction, depth, etc.). After a thorough clinical analysis dentists choose the best implant systems for you and choose the size of the implants in your particular case. There are many and various implant systems. Best so far are two-part screw implants. Our clinic works with different systems (German, Swiss and South Korean origin) that are certified and meet international standards ISO. Operational intervention begins with the placement of a local anesthetic (the patient is fully conscious) and the placing of one or several implants. The duration of the procedure depends on the number of implants and the complexity of the case. Standard operation lasts from 30 min to 1 h (for1 implant). After placing the implants, roofing screws are placed. You are adviced to do a control panoramic photo. Three to six months later, is the next stage of treatment - detection of dental implant. Removing the roof screw and placing a gingiva former. Seven to ten days later, we take it off, place a special transfer pin and take an impression with individual spoon. After the impression is taken, we sent it to the dental lab and the implant is closed with gingiva former. Once the construction is ready, put on abutment over the tooth implant and proceed to adjusting and cementing the structure. It is not recommended placement of dental implants in patients under 18 years of age, as it is completed bone growth. There are no upper age limit. Contraindications for placement of dental implants are certain systemic diseases. Each patient should be aware that placing dental implants is a painless procedure because it is done under anesthesia. The patient is given instructions carefully and shown how to clean the dental implants and observe strict oral hygiene because the success of the procedure depends very much on the personal responsibility of the patient. Check-ups over a period of time. The methods of implantation are generally 2 - Immediate and late implantation. In immediate implanting the dental implant is placed into the bone immediately after extraction of the tooth. There is an opportunity for early loading of dental implants (* if an Immediate implant loading is used) because immediately after their installation a construction is made (within 3 days). The advantages of this type of implant is that it shortens the period of treatment, and it is possible immediately after implantation the crown to be placed on the tooth implant. a) single stage - when it is placed immediately gingivo former. Constructions may be performed several days after the intervention (3 days), or to wait for a period of 3-6 months (at the discretion of the implantologist). a) two-stage - the most common method used in implantology. In this case is removed the muco periostal flap, place dental implants and flap is sutured. Waiting for three to six months. The next step involves the detection of dental implants and placement of abutment. The most important advantage of this type of implant that provides a longer period of osseointegrated implant in the bone. It is important to discuss with your implantologist which method best suits your particular case. Everyone is individual - if you choose a certain method, then for another patient it may not be applicable or is better suited another option. The methods of implantation are generally 2 - Immediate and late implantation. In immediate implanting the dental implant is placed into the bone immediately after extraction of the tooth. There is an opportunity for early loading of dental implants (* if an Immediate implant loading is used) because immediately after their installation a construction is made (within 3 days). Sinus lift with access crest (closed sinus lift) - is performed under local anesthesia in the bone socket. This is an one step method. After reaching the floor of the sinus, trepanation of the bone is performed, and then lifted into the sinuses. The method is more non traumatic than with open sinus lift. It may be necessary to install substitute bone substance. A disadvantage of this method is that there is a limited lifting of the sinus mucosa. In cases where it is necessary a greater lifting of the mucous membrane, is done by lifting the lateral sinus access. Dentures on dental implants is as important procedure as the actual placement of dental implants. * prosthesis over dental implants and natural teeth - in this case, as the support pillars, comprise dental implants and natural teeth. Proceed to this type of surgery at the discretion of the prosthetist (it evaluates the condition of natural teeth, how reliable will they be in time and what problems may arise thereafter). * Dentures with joint custody - they are firmly attached to two or four dental implants by special devices in the prosthesis. - It is an advantage that the denture is firmly secured on the dental implants, and can be removed every day in order to be cleaned. * Dentures, attached to overimplant sleepers – bars hold the denture on the structure associated with the implant. - It is an advantage that the denture is solid and can be removed on a daily basis in order to be cleaned. * Dentures - fixed crowns and bridges - place of six or more dental implants and artificial teeth are attached securely to the implants by cement. This type of fixed crowns and bridges can not be removed. - Advantage is that it is most closely resembles to natural teeth. Zirconia implants on - fixed restorations made from zirconia dioxide. From an aesthetic point of view, are of great interest recently introduced abutments from zirconia dioxide. This material is highly biocompatible and provides stability peri implant tissues. 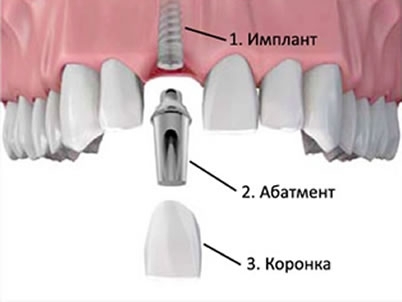 For preparing these abutments, a special CAD-CAM technology is needed. There are also factory-made, single and individually modifiable skeletons of zirconia dioxide. These upgrades are applied to both the front area and in the area of ​​the side teeth. Upgrades can be shaped with ceramics, eg. lithium disilicate (IPS e.max). It is recommended frontal structures to be covered by layering technique (IPS e.max Ceram), and distal skeletons pressed with IPS e.max ZirPress, to achieve greater mechanical strength. The use of zirconia abutments, mainly in combination with all-ceramic restorations, it is possible to produce high aesthetic and biocompatible recovery which is crucial for the front area.